Step 1 Sprinkle the yeast over the warm water and stir to dissolve. Let the yeast mixture stand while preparing the remaining ingredients. Step 2 Heat one-half cup of the milk in a small saucepan to just simmering. Remove it from the heat and add the cut-up butter, stirring until melted. Stir in 2 teaspoons cardamom, one-half cup granulated sugar and the salt. Allow the mixture to cool to warm. Step 3Pour the warm milk mixture into the large bowl of an electric mixer. Add the yeast mixture. Beat in the eggs one at a time, and then beat in 2 cups of the flour. Beat until smooth. Add enough of the remaining flour to make dough easy to handle. Step 4Lightly flour a board and turn out the dough. Knead the dough until it is smooth and elastic, about 5 minutes. Step 5Put the dough into a buttered bowl, turning to coat all sides of the dough with butter. Cover and let rise in a warm place until doubled in size, about 1 1/2 hours. Step 6Roll the dough with a rolling pin into a h 18-by-12-inch rectangle. Spread 2 tablespoons of the softened butter to within half an inch of the edge of dough. Sprinkle with the remaining 2 tablespoons sugar combined with remaining 1/2 teaspoon cardamom. Step 7Using your hands, roll the dough up tightly from the long side to form a cylinder. Slice into 12 rolls. Place the cut rolls in a buttered 9-by-13-inch baking pan. Cover and let rise until doubled, about 45 minutes to 1 hour. Bake in a 350-degree oven until golden brown, about 30 minutes. Step 8While the rolls are baking, make a glaze by combining the powdered sugar, the remaining one-fourth cup milk, the remaining 2 tablespoons butter and the vanilla. Stir until smooth. Step 9Remove the rolls from the oven and let them stand for 5 minutes, then drizzle with the glaze and sprinkle with the chopped hazelnuts. In Recipes-list.com we have selected the most viewed recipes from category - Best recipes Breakfasts Desserts . Enjoy the best recipes specially selected for you! 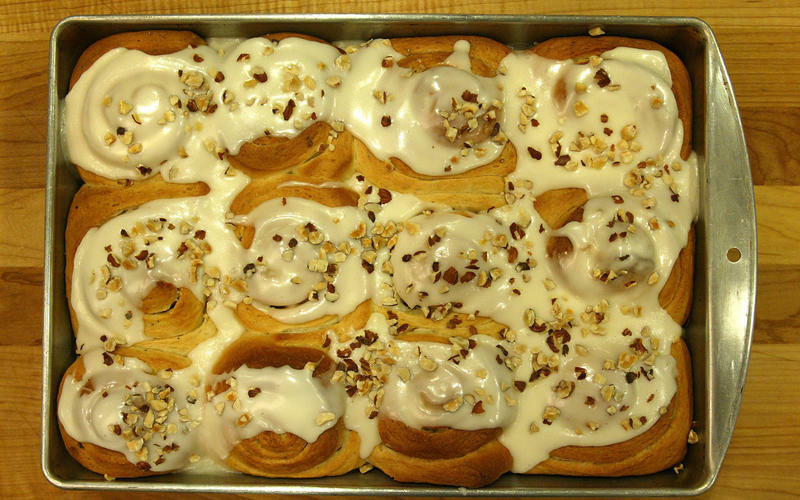 Cardamom sweet rolls is the right choice that will satisfy all your claims.